Prosper Van Eechaute was a Flemish conductor and composer, who taught at Ghent Conservatoire and was director of Kortrijk Conservatoire. His Pièce Sonate pour 4 violoncelles op. 9 dates from 1939. The composer's enthusiasm for Ravel is echoed in this deliciously evocative score, which is generously soused in impressionistic tints. He even quotes from Daphnis et Chloé. The work exploits the four cello combination to the full, employing effects such as luminous harmonics which begin and end the piece, and pizzicatos which add shape and structure to the music. Gentle lyrical episodes alternate with more rhythmically vital sections. The Croatian composer Rudolf Matz was an esteemed pedagogue who could credit 32 textbooks on cello playing methodology to his name. Leonard Rose called Matz 'perhaps the greatest cello theoretician in the world'. The D minor Quartet has been recorded before by the Tansman Cello Quartet on the Antartica label but I haven't heard their version to offer any comparison. Matz draws on a mine of sources for his five-movement work including early music, polyphony, Romantic music and quotes from Rossini operas. Two movements make a forceful impact: the second, marked Intermezzo: Andante, where pizzicatos usher in a pleading lament, and a particularly attractive, exuberant and spicy finale upon which the players lavish great enthusiasm. I was interested to discover that the Polish cellist, composer and conductor Kazimierz Wiłkomirski is the half-brother of Wanda Wilkomirska, a violinist I greatly admire. His Ballade and Rhapsody of 1961 is a transcription of two movements of his String Quartet. The solemn pizzicato pulses confer a funereal cast over the Ballade. Its dark and sombre strains are fervently declaimed by the Polish Quartet's impassioned narration. The composer ups the rhetoric in the Rhapsody, combining heroic drama with dance elements from Polish folk music. We step back in time to 1891 for Alfredo Piatti's In vacanza (on holiday). The work consists of three linked movements which relate departure, arrival and country dance. 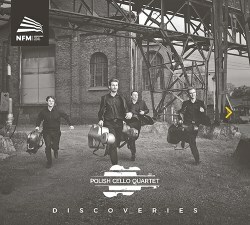 Its genial demeanour offers some light relief to the Polish Quartet's other more seriously-framed pieces. The ensemble truly relish this effervescent excursion with infectious ebullience. I never imagined that four cellos could achieve such a panoply of polychromatic hues. Nor could I ever have believed that this combination of instruments could sound like a string orchestra. I suppose it’s all down to the skill of the composer utilizing the full potential of the instrument. The music has been recorded in state-of-the-art sound quality, with balance between the four instruments faultless, allowing these incandescent performances to emerge with clarity and definition. This is a stunning release, and one that has given me no end of pleasure. I’ll be returning to it often.